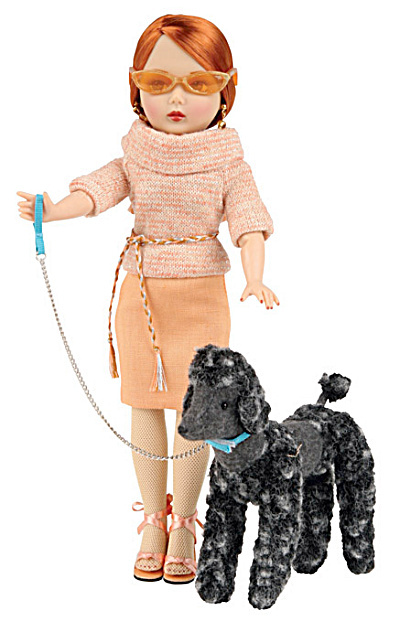 Vogue Poodle Walk Modern Jill Doll with jointed gray poodle dog and leash, 2009, No. 9JL06 is a 10.5 inch hard vinyl doll has jointed knees and elbows, straight red hair pulled back in a straight ponytail, and painted brown eyes. Her ensemble includes a shiny knit peach-pink sweater with collar and gold cord tie, a pink sheath skirt, glasses, and coordinated peach-pink high heel open-toe shoes. Her accessories include matching pants that appear pedal pusher length, gold earrings, and a blue leash around her poodle's neck. Her glasses are clear and not tinted. Limited edition of 250. New, and mint in the box old stock. Expand listing to view both the photograph of the doll and her dog and her extra pants.